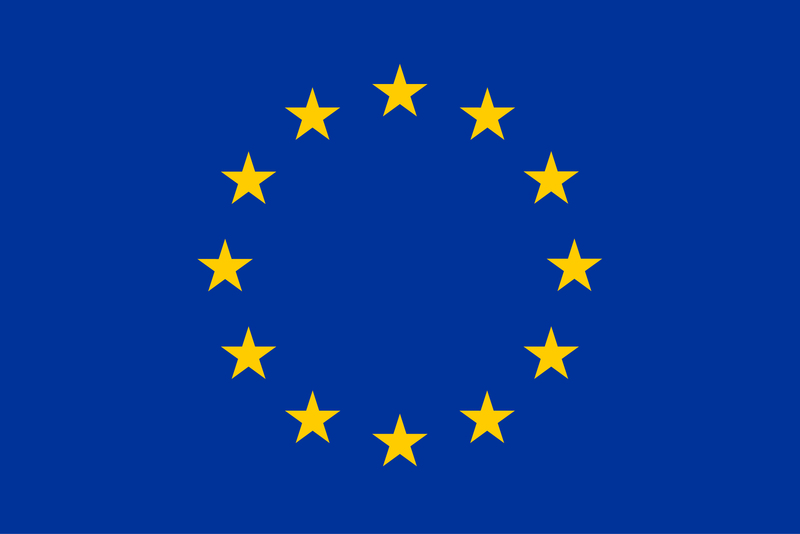 The HARMONI SPIRE H2020 project organised a joint event on 16-17 January called “HARMONI summit”. The objective of this meeting was to encourage the dialogue on an effective framework to facilitate and foster the innovation in EU industries. More than 150 experts engaged in the exchange of ideas coming from all sectors of the process industry. 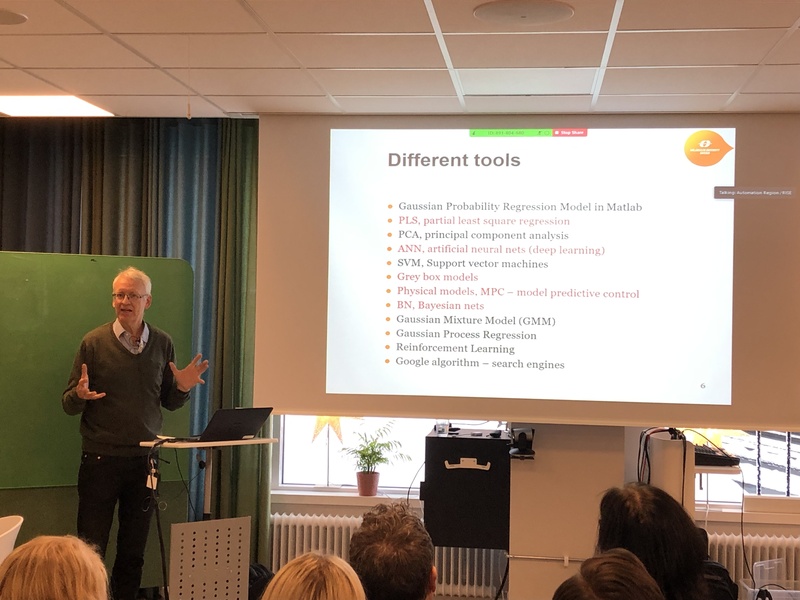 One of these experts was Erik Dahlquist from MDH, who is the FUDIPO project coordinator. Thus, our coordinator gave a presentation of FUDIPO project and had a panel discussion about how to commercialize the innovations and results of EU projects. You can download this 2019 HARMONI Summit – Press Release_0 launched by HARMONI project to know more information about the event. 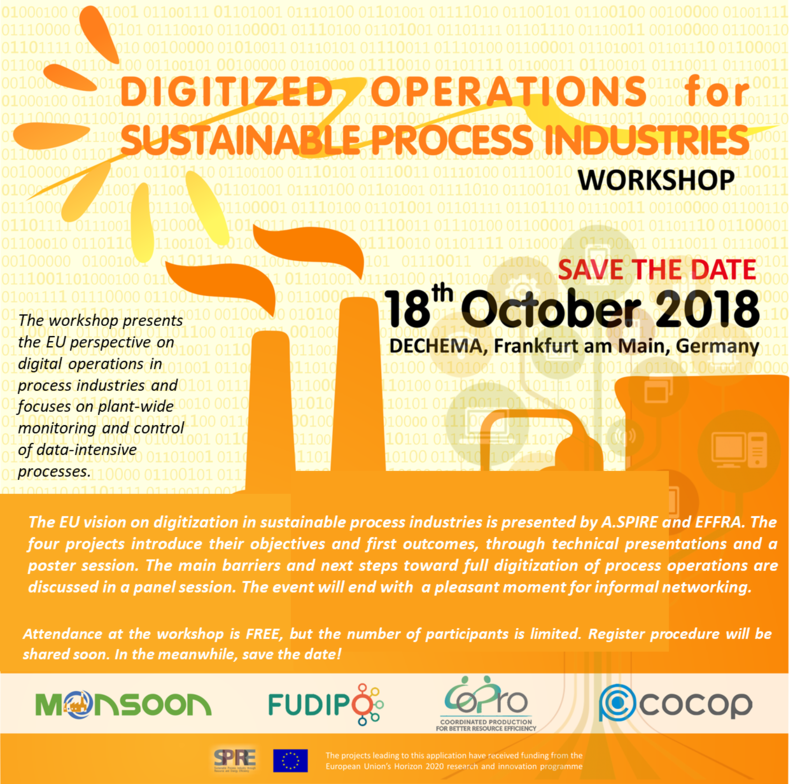 On 18th October (2018), the consortiums participating the COCOP, CoPro, FUDIPO and MONSOON projects celebrated a workshop in Frankfurt, in DECHEMA facilities. The event, which was titled “Digitized Operations for Sustainable Process Industries”, was a complete success and succeeded in bringing interested parties to it. Both the Project Officer Angelica Marino and the External Advisor also joined the event. 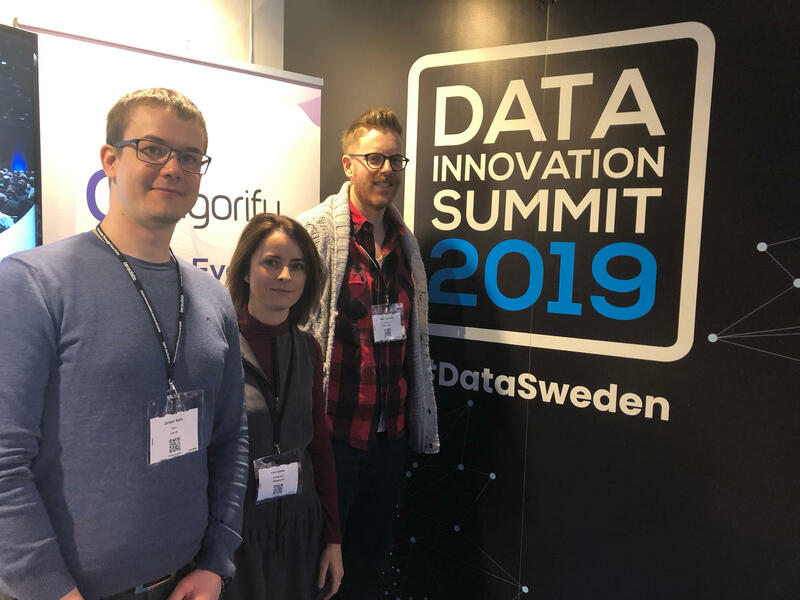 During the sessions, the four participating projects explained how they were tackling the industry needs and which digital solutions they were building. Moreover, the time between sessions allowed for a great exchange of impressions and knowledge between the different participants, and also with the other entities that assisted to the event. Lastly, a panel named “Full digitalization of process operations – chances and challenges” took place. This panel was participated by Martin Winter (chair of SPIRE Digital Working group, A. SPIRE), Jane Arnold (Head of Global Process Control Technology, Covestro), Manuel Remelhe (Technology Senior Expert,BAYER AG) and André Augé (Statistical and data processing Manager, Rio Tinto / European Aluminium). During this panel, the experts presented their view on the future of the digitalisation of the industry and the public was able to raise questions and generate very interesting debates. Some presentations by FUDIPO as the one of Moksadur Rahman titled “Advanced Control of Continuous Pulp Digesters” took place presenting results about specific study case. Valentina Zaccaria and coworkers from MDH University (partner of FUDIPO), has presented a conference paper related to the project proposing a framework for monitoring, diagnostics, and health management of a fleet of aircrafts, consisting of a multi-level approach. After one year and a half from the project begginings, FUDIPO consortium members met last 24-25 April in Brussels to present the project’s progress and new advances to the reviewers. The meeting was divided into two different sessions, the first one celebrated the first day exclusively among the consortium members and the second one with the presence of the reviewers. First-day presentations were about the state of the project implementation in different case studies. Demonstrator leaders presented the progression status, new advances, drawbacks and to-do actions for future months. Finally, partners were divided into different working groups during workshops to discuss about the states of different ongoing tasks to evaluate actions done and plan future actions. Consortium members took advantage of this to improve communication and plan actions if needed. The second day, different partners presented new advances and tasks evolution to reviewers. The day started with an initial presentation of deliverables and milestone status. Then, the chief engineer presented a summary of demonstrator status and technology development. Idener gave a presentation about the dissemination activities done until date and future activities according to dissemination plan. The financial status was presented by the project coordinator and presentations about the study cases were presented by demonstrator’s leaders. Mälarenergi, Tupras, MTT, Billerudkornäs and ABB presented an overview of the tasks progression. BestWood/Fraunhofer and Tieto also presented advances in sensor and architecture development respectively. Questions and suggestions were formulated by reviewers during different partners presentations, taking note of the valuable feedbacks. The meeting was a useful experience to catch up on different tasks status. Next meeting will be held on 17-18 October 18, but the location it is not defined yet.